I’m a fan of apocalyptic novels, and that probably started with Stephen King’s The Stand, so the book description and the fact that it’s labeled as horror – along with the fantastic cover – made me want to read this novel. And it didn’t disappoint. As a parent, I could identify with David’s need and overpowering urgency to protect his daughter and attempts to shelter her from the horrors around them; however, David is definitely not a person I’d like to be on the run with. He makes so many mistakes with regards to their whereabouts and wastes money on such frivolous things, that I was cringing and shaking my head in several spots. Ellie is intuitive, mature, and wise beyond her years and makes several thought-provoking points regarding humanity and responsibility. I liked the way the author gradually reveals the backstory, alternating between past and present in several chapters. There are many macabre visuals – people wearing Halloween and paper plate masks, the hallucinations and physical symptoms the infected people experience. And some of the characters – the ice cream man and that weird backroads family in Kentucky – make for some morbidly suspenseful scenes. Personally, I would have liked to learn more about Ellie, but with the ending, I have to wonder if the author is considering a sequel. If so, I’d love to read it. 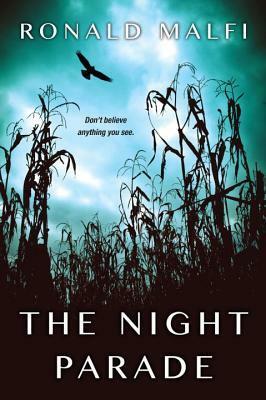 The Night Parade isn’t a gory-type of horror novel – it’s a story with a dark tone that inspires feelings of hopelessness and anxiety in the reader and I found it difficult to put it down. This book is scheduled for publication July 26, 2016. Excellent review! I’m a huge fan of Ronald Malfi, but I’ve been shopping around to see if this would be his next title on my TBR or if it’d be Floating Staircase. Thanks! I think you just convinced me. Thanks! I haven’t read any of his other titles, but this one definitely gives me incentive. Dark, unsettling, supernatural, and terrifying? Count me in. Malfi really scares me. Great review here.